This is a very old gene noticed in the 80's which was at one time club recognized and standardized. The gene was thought to be lost. But it has resurfaced and was rediscovered by Jennifer of Emerald City Rattery. She got it from a breeder who didn't keep pedigrees in Arizona, and this breeder has since stopped breeding. No one else seemed to get the Whiteside gene from the AZ breeder. Soon after that, Jennifer moved in with my family, and during the earliest generations, I got to see and help her raise these litters and observe it. During the earlier generations we were not sure what the gene was. But we knew it wasn't anything we had ever bred before. Something wasn't adding up there, as it was bred into a hooded line, and they were throwing hooded with "pants" as RuBY called it. And they had perfect self feet. I didn't want to breed those into my hooded line because I am so careful with how the patterns look on my line and this wasn't the correct pattern for a hooded. Although it was really cute. And while yes they were being raised in my family room and she kept offering them to me I kept declining since I didn't want that pattern added to my line that I've bred for 24 generations to look the way they do now. Eventually as Jennifer from RuBY kept posting litter pictures on facebook, they caught the eye of Connie Perez, who wrote the standard for them many years ago. Connie was excited to see that it had resurfaced and started contacting Jennifer and asking questions about how Jen's gene worked, and yes it seems to be the same gene. The Whitesides had resurfaced! Connie also started contacting me, and sharing the history and standards of the Whitesides. She had a wealth of info on them. Since I didn't keep any WS when Jen lived with me. I shipped them back here from Jen after she moved to NY. 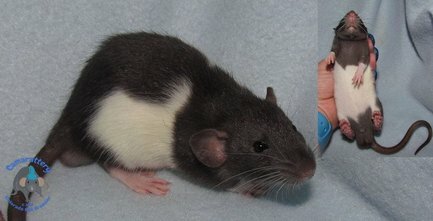 Now it has been discovered that many other breeders in the US and Canada have the gene as well and they had all mis-labeled them as bad hooded like we had done as well. 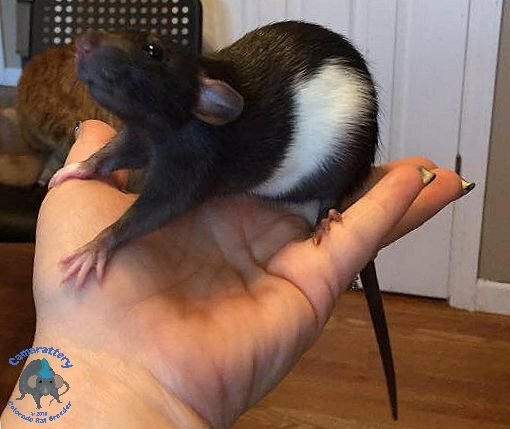 So the community of WS rats is growing again! Whiteside is a basic recessive gene and can be on any pattern. Basically you can breed them for any pattern. 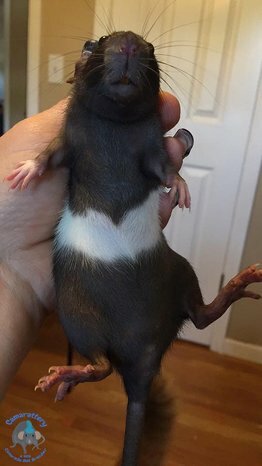 On marked rats it breaks up the stripe on the back making more of a white band white feet and white tail as per the normal tail for the marking the WS is on. On a self or Irish it makes more color on the body with self and Irish feet and tail. Like the female pictured below. This female is either Self or Irish. She needs testing.